Parents need to empower children with coping mechanisms for this overly active world and help them to deal with the challenges that life throws their way – yoga is one such mechanism. Each Yoga session incorporates breathing, stretching and relaxation, whilst also teaching participants how to ‘be present’ and how to create positive emotions. Our promise to your child is to facilitate them in becoming proud of their own identity while gaining a strong sense of self-worth and self-acceptance. 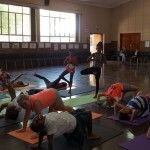 Yoga takes place in the Tom Newby School Hall on Fridays. Yoga runs from February to November. Please refer to the TNS extra mural schedule for times. Any comfortable clothing can be worn. All equipment is provided.